Here’s to finishing a second baby throw! I knit the last two weekends straight to get this finished – unfortunately the photos aren’t great but I’m hoping to get some better ones in the days to come. 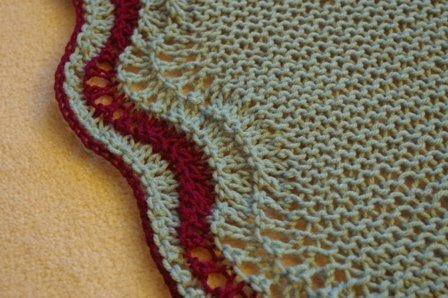 The throw is actually baby-mint-green and a gorgeous plum-purple colour for the third Feather & Fan repeat and bind-off. The dimensions are the same: 36″ x 38″ in worsted weight acrylic on 8.00mm circular needles.